This Guide to Catalogs and Bulletins published by the Pine Mountain Settlement School, is for the period of 1913 to 1949. No catalogs have been published since 1949, as no sustained, residential educational program has been in place since that date. 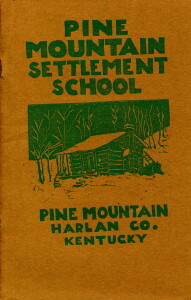 After 1949 the school had a cooperative program with the Harlan County School system and maintained several educational programs which served the local community. The Community School is no longer in operation and the “Little School” in its original form are no longer in operation. However, a new Little School program has been initiated under the direction of Geoff Marietta in 2015 and has won state and national attention. Currently, the Environmental Education Program serves a broad spectrum of educational needs through an on-site educational program for schools in Kentucky and adjoining states. It provides short-term residential environmental experiences for students in K-12 educational institutions.